I read this so, so long ago that I honestly don't remember whether I liked it or not. I don't even remember the plot--I just remember the dog's name was Mike this time, and Danny was his caretaker just like for his dad. I'd skim through it to jog my memory, but I read it at school and have never owned my own copy, so that's not really an option. This is one of the books I read before I started keeping my book list. Even though it was years ago, I remember the story and how much I loved it.The date is estimate. Not my favorite Kjelgaard novel but a darn good dog book. Catching up on a few classics I apparently missed before. This sequel to Big Red was more enjoyable for me. It focused on training setters. The book was written before much of the conservation and ecology work was done and reflects that. I give credit to the book for talking about not trapping when the number of animals drops as they are important to the forest.Irish setters are wonderful dogs, beautiful, loyal, sensitive and filled with boundless energy. They must be treated carefully as they are trained. Hitting them devastates them. Laughing at them crushes them. [We had one. ]Jim and his father Ross live in the Wintapi woods, hunting and trapping for a living. They love their dogs and Jim wants to become a Irish setter trainer. It seems he is given the chance to work with a professional trainer.The opportunity is not what it appeared to be. And the Irish setter Mike is the challenge Jim must overcome to show that Irish setters are great bird dogs.The book is old and a bit dated. It's pace is a bit sedate. Still, the book is a good book especially for those who do like to work with dogs or love the wilderness of the New York mountains. A sweet tale about a "worthless" dog who just so happens to actually not be as worthless as at first made out.It's about the bond between man and animals and betraying that trust. I think it's also about speciality and the fact that you might be specialized in one type of dog but not in another, which can then be related forward to other things in life such as just because you are old or 'experienced' doesn't mean you know better than someone else. This story flicks between owner thoughts and dog thoughts. very interesting to see how a human perceives animals to think. And a charming way to tell of the reason Mike decides to become a dog working with men. Sort of predictable, in fact extremely predictable, and sort of finishing quite abruptly the story is perfect, and I wouldn't change these small let downs, they kind of make the story as charming as it is. This book was in and out okay but at the 5 chapter i was feeling that the book wasn't okay.If you were a some what younger kid i would recommend it but if it was for older kids you may not want to read this book.I really didn't like it so i probably would not read the whole thing.The book was funny in the begining but somewhat advanturist. The main characters would be Irish red and Mike they loved each other in a way they loved to hike.the setting of the story takes place at Wintapi and. One day they were taking a hike and found a guy traped in a cake and they, (irish and mike) had heard a really quiet yelling and it was the owner to Irish red.Then the biggest snow storm in history and had to find there way back. This was a fantastic sequel to Big Red! I loved following Mike's journey to becoming a mature dog. That was probably the over-arching message of this book: that just because someone is a late-bloomer, doesn't mean they have less potential. Mike's was a coming-of-age story, and he went from a mischievous, unruly renegade of a puppy, to a woods-wise, independent, and loyal dog. Mike is a character that has to learn some hard lessons in order to figure out that cockiness isn't always an asset. Great nature details pervade the book, as well as fascinating descriptions of canine behavior. Great read! For my feelings in further detail, see my review for Big Red. A sequel to Big Red. Mike is the runt of the litter of Big Red and Sheila's pups, and will never amount to anything-so Danny Pickett and everyone else but his dad, Ross, think. But it will take a combination of events to tame the rebel Irish red's heart, and cause him to prove to them all that a champion is inside. Jim Kjelgaard spins a wonderful story about a boy and his dog. When I was 8, I read this book and have read it over again several times. The bonding that takes place between Danny and Mike make this a good feel story. It also illustrates the dangers of the weather, the wild, and ultimately, how to survive. This sequel to Big Red was much much more enjoyable to read. Again, this is probably because Kjelgaard focused more on the thoughts and adventures of the dog, Mike, than the humans. I like when he writes that way. The dog names are admittedly...odd. Mike? Eileen? Weird names for dogs... Overall, a great tale of a misfit dog coming out on top. Big Red is the best of this series. I find the author astute in his understanding of dog behavior and their relationships with humans, but a bit too repetitive in his descriptions of the dogs, personification of the dogs. This is one of my favorite dog books from childhood. Even though it's the sequel to "Big Red", I read this one first and I actually enjoy the story more. This book will make you fall in love with Irish Setters. An unruly headstrong Irish Setter runt gets a new start and makes the most of it. In the end, the carefree Irish Setter beats the stiffly trained robotic English Setter. No matter the bread, whipping and overly training a dog into submission is no way to raise a true and stylish hunter. Mike, what can you say about him? He may have been born a misfit, but in this sequel to Big Red, he proves he has the heart, courage, love & loyalty his father has. It is a heartwarming story of the underdog overcoming adversity to come out on top. 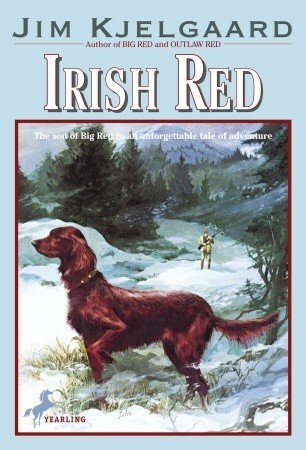 Jim Kjelgaard's Irish Setter books are the ultimate boy-and-his-dog adventure stories. Although it has been a very long time since I read them, I do remember that they completely enthralled me at the time, and captured my heart and imagination. I read this last year after re-reading "Big Red." This is also a top flight book even though it is written for kids. I love books about animals. And dogs are some of my favorites. After reading Big Red for the upteen millionth time, I finally expanded to the other Red books and read them about 20 million times, too. My mom still wouldn't let me get an Irish setter, though. A perfect choice for kids who love books like "Hatchet. "Loved it. One of my favourites as a kid, this is a book I'll never be able to get rid of, even though I'm unlikely to read it again. Another childhood favorite - great book for young readers. I read this book when I was going through my dog-story phase.